Originally, this dish was supposed to be pork paprikash. However, I didn’t have enough paprika in the house (or any egg noodles, over which I prefer to eat my paprikash) and so I switched it up a little bit. The result was absolutely delicious, though, and had a nice smoky heat to it from the paprika that was included. There were many layers of flavor to this wonderful stew, which could also be served over egg noodles or rice. I really love a good, hearty stew on a cold fall or winter night, and we’re getting to that time of year in Cleveland. I realize this looks pretty darn similar to B’s Sauce, especially because we happened to use the same pasta type, but the taste is very different. In a medium stock pot, heat canola oil over medium heat. Add onion and sauté until translucent, about 4-5 minutes. Add garlic and sauté until fragrant, 1-2 minutes. Add mushrooms and sauté until lightly browned, about 5 minutes. Add pork and season with salt and liberally with pepper. Sauté until heated through, about 3-5 minutes. Sprinkle with flour and stir thoroughly to combine. Add paprika, caraway seeds, crushed red pepper flakes, and again, liberally, with pepper. By now you should have added about 2 tablespoons of pepper. Add crushed tomatoes and chopped parsley and stir to combine. Add Merlot and raise heat to medium-high. Simmer until liquid is reduced by 50%, about 20-30 minutes. Add chicken stock and simmer another 20-30 minutes until liquid is thickened and reduced. Remove from heat and stir in plain Greek yogurt. 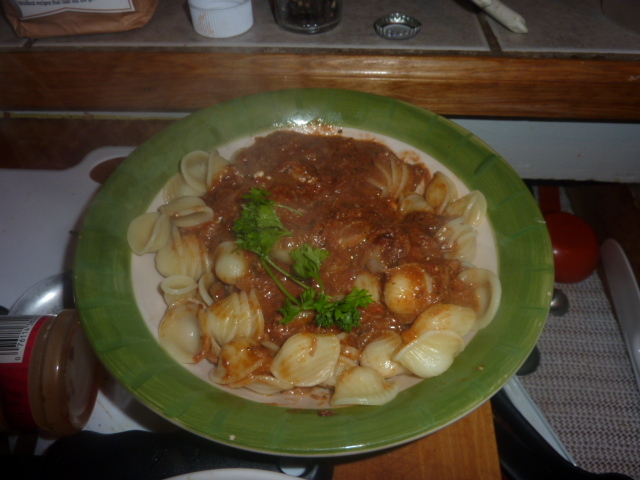 Serve over cooked pasta (pictured is orechiette, though it would probably be better with egg noodles). I’m a big fan of braises and roasts. Sear your meat, cover it with some liquid or sauce, and and throw it in a low oven before leaving for work (or, in my case, school) in the morning. Then, when I come home in the evening dinner is more or less ready. Plus, you get all 8 hours of flavor jam-packed into whatever meat you are cooking and tender meat that falls apart at first touch. Now that the weather is cooling off, braises and roasts are the perfect comfort food – especially because they generally provide for lots of delicious leftovers. This pork shoulder was juicy, tender and mouth-wateringly aromatic and flavorful. 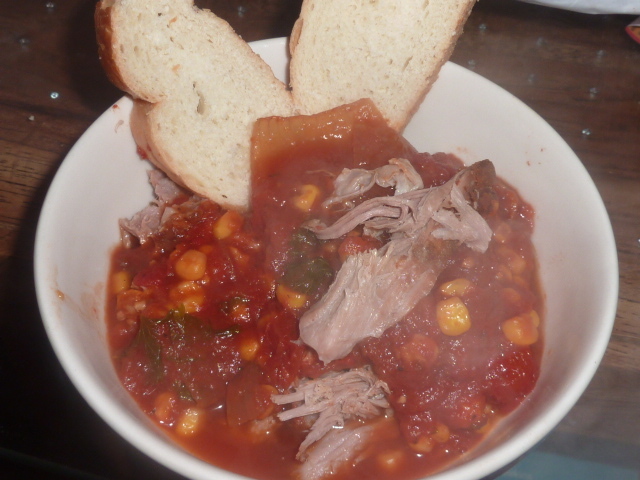 Served with some crusty French bread to sop up the accompanying braising liquid, this was a delicious, healthy dinner. Combine all ingredients except pork shoulder and whole marinated garlic cloves. Cut six small slits spread across the pork and insert the garlic cloves. Rub the entire pork shoulder with the rub. Let sit for 2-3 hours. Spray a large skillet with non-stick cooking spray. Heat over high heat and brown pork shoulder on all sides, roughly 2-3 minutes per side. Remove from heat. Rub the pork shoulder on all sides with tomato paste. Spray a large casserole or dutch oven with cooking spray and add pork shoulder. Cover with tomato slices. Add tomatoes, with juice, and onions. Cover casserole tightly. Place pork shoulder in oven and roast 8-10 hours (it would probably be fine after 4-6 hours, but I put it in before leaving for school at 8:30 and didn’t remove it until 5:30 or so), adding corn kernels for last hour or so. Remove pork shoulder from oven. Remove meat from braising liquid and keep warm by covering with tin-foil. Place braising liquid and vegetables in a medium stock pot. Let sit 10-15 minutes and skim fat from the top. Add salt, pepper, garlic powder, and chopped parsley. Simmer over medium heat 15 minutes or until reduced by 1/4. Meanwhile, shred desired amount of pork (I used less than half of the roast for the two of us). Place the shredded pork in the bowl and top with a few heaping ladles of braising liquid, making sure to include some onions, corn, and tomatoes. Serve with a few slices of French bread and butter or butter substitute.